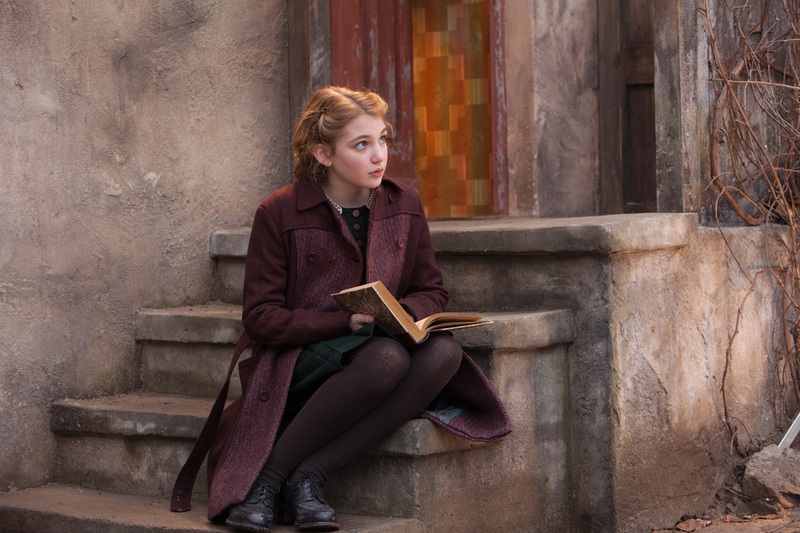 The Book Thief tells the story of Liesel Meminger (Sophie Nélisse) who, following the death of her younger brother, is sent for safety by her Communist mother to live with foster parents Hans (Geoffrey Rush) and Rosa (Emily Watson) Hubermann. Frightened and lonely in her bewildering new surroundings Liesel withdraws from those about her, until the kindly Hans teaches her to read. This pleasurable pastime – along with the friendship of Rudy Steiner (Nico Liersch), a boy at her new school, – starts to bring Liesel out of herself and happy for the first time in her new home. These pleasures are short-lived however as the outbreak of the second world war brings untold horrors upon her adoptive family, as well as a visitor to their house whose presence has dangerous and far reaching repercussions. It’s not just the hauntingly realised setting against which the often harrowing story plays out, that makes director Brian Percival’s visualisation of author Markus Zusak’s bestselling novel such an arresting cinematic experience. The masterly Rush, in films like Shine (1996), and Watson in Angel’s Ashes (1999), have built solid screen careers embodying characters who manage to survive, some might even say flourish, through the harsh adversities of life. Qualities which are once again on view here. Rush’s depiction of the gentle Hans and his obvious distress when he’s conscripted to fight in the war, and Watson’s embodiment of Rosa and her outward coldness which hides a steely tenacity to protect her family in the face of seemingly insurmountable odds – bring a humanity and bleak realism to an historical period which is all too often sanitised by Hollywood. More than Rush or Watson however, it is Nélisse who stands out in a breakthrough performance which has seen her win a clutch of awards on the international festival circuit. Her depiction of a young girl traumatised not just by separation from her natural family and inclusion into another, but also by the life altering world events which at times literally explode around her, is mesmerising. It is also such simple things as her interpretation of Liesel’s delight in books (which regularly places her in potential danger) or the incident (based on fact) where Liesel breaks down during one of the infamous book burnings carried out by Hitler’s army (that will move anyone who loves the printed word) – which display a maturity that many more experienced thespians would be envious of. This, along with her connection with Max (Ben Schnetzer) – the young Jew for whom Hans and Rosa risk their family’s lives when they hide him in their home – portrays an innocent naïvety towards life’s cruelties which is often lost as we get older. The Book Thief is a masterpiece of celluloid storytelling which, like all great literature, draws its audience in until they feel a part of it themselves. It never ceases to surprise, even after almost seventy years, how much in the name of entertainment is still derived from a subject as sensitive and divisive as the Second World War. However, when films like The Book Thief are as moving in their representation of humanity and courage as they are in their unflinching evocation of that period’s atrocities, you can begin to understand their continual fascination and justification.